A bishop who met with Pope Francis in a rare private audience last week has said in an interview that the two men discussed the issue of the ordination of 'proven' married men – viri probati – in a serious and positive way, reports The Tablet. Bishop Erwin Kräutler, Bishop of Xingu in the Brazilian rainforest, spoke to the Pope about Francis’ forthcoming encyclical on the environment, and the treatment of indigenous peoples but the desperate shortage of priests in the Bishop’s huge diocese came up in the conversation. According to an interview which the Austrian-born bishop gave to the daily Salzburger Nachrichten on April 5, the Pope was open-minded about finding solutions to the problem, saying that bishops’ conferences could have a decisive role. 'The Pope explained that he could not take everything in hand personally from Rome. We local bishops, who are best acquainted with the needs of our faithful, should be corajudos, that is "courageous" in Spanish, and make concrete suggestions,' he explained. A bishop should not act alone, the Pope told Bishop Kräutler. He indicated that 'regional and national bishops’ conferences should seek and find consensus on reform and we should then bring up our suggestions for reform in Rome,' Bishop Kräutler said. Asked whether he had raised the question of ordaining married men at the audience, Bishop Kräutler replied: 'The ordination of viri probati, that is of proven married men who could be ordained to the priesthood, came up when we were discussing the plight of our communities. The Pope himself told me about a diocese in Mexico in which each community had a deacon but many had no priest. 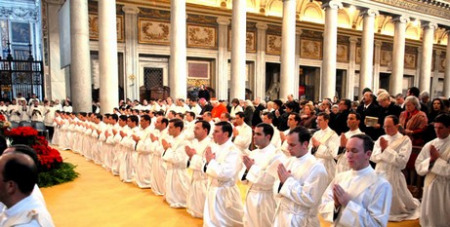 There were 300 deacons there who naturally could not celebrate the Eucharist. The question was how things could continue in such a situation.